As you know last year Ariens let MovingSnow use their new Deluxe 28 AutoTurn 2-stage snow blower and new Ariens PathPro 208Ec snow thrower. Both turned out to be great machines, The Deluxe 28 is designed as an entry level homeowner snow blower. The PathPro is designed as a great cleanup tool for commercial operators. 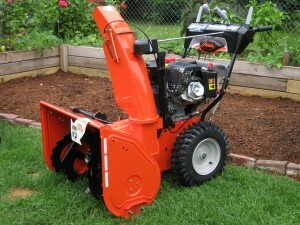 This year Ariens really upped the game and is letting us use their new Platinum 30 SHO Sno-Thro and the Hydro Brush 36. Here is a quick summary of what these 2 machines are expected to do. This snow blower is the flagship of Ariens Homeowner lines. It is a heavy-duty, high powered, state-of-the-art snow blower. This year the SHO has the Auto-Turn™ steering, Quick Turn chute rotation, hand warmers and a engine that just won’t run out of power. It’s not cheap but this may be the snow blower that you pass on to your grandkids. I will spend more time going over the features and showing you what this snow blower is capable of later this fall. Hint: SHO stands for Super High Output! There a very few reviews of power brushes on the web. These machines are capable of a lot more than just cleaning snow off a sidewalk. They can be used to not only clear snow, but also dethatching, nut harvesting, storm cleanup, parking lot renovation and general cleanup. Of course they excel at quickly cleaning hard packed snow, ice and debris from large areas or places that just are not practical with other yard tools. 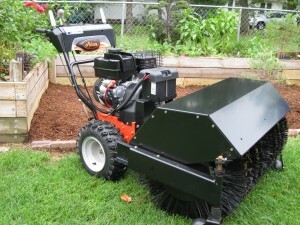 The Ariens Hydro Brush 36 is a true commercial sweeper and has features that will impress large estate owners, condo associations, horse farms, schools, and other public places. I will spend more time going over the features and showing you what this power broom is capable of later this fall. Hint: This thing is a beast! Hi Paul, l think your articles are the most informative and well written. I just ordered a 2017 Ariens Pro 28 and can’t wait to get it. I’d be very interested in your opinion of this snow blower starting from the B&S 420cc engine right down to the commercial grade skid shoes. Looking forward to your reply. Thank you Paul, l’ll check it out.